I think that is what Tom Haverford from Parks and Rec would call this recipe. Please tell me you are watching Parks and Rec. Best sitcom on TV- hands down. 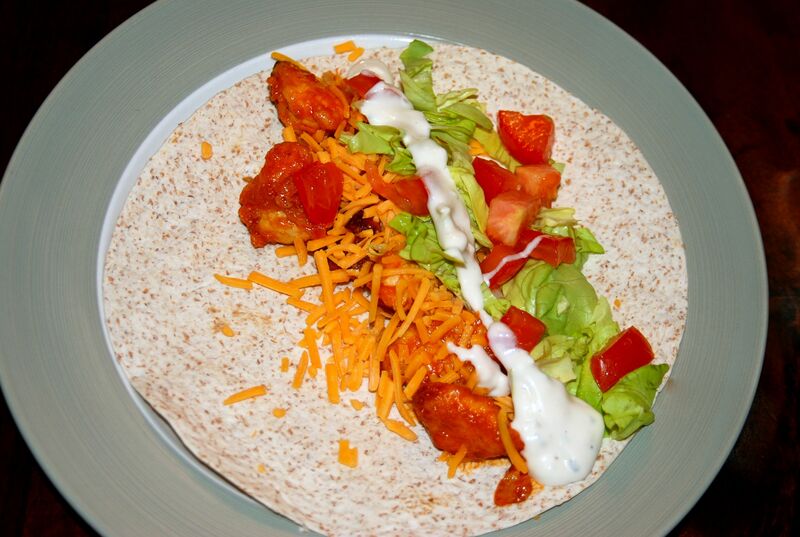 The long name of this dinner is Buffalo Chicken Tacos. I found a folder on my desktop called BuffChicTac, and I realized with horror that I never posted this gem of a dinner. If you love all things buffalo flavored, these bad boys will be right up your alley. 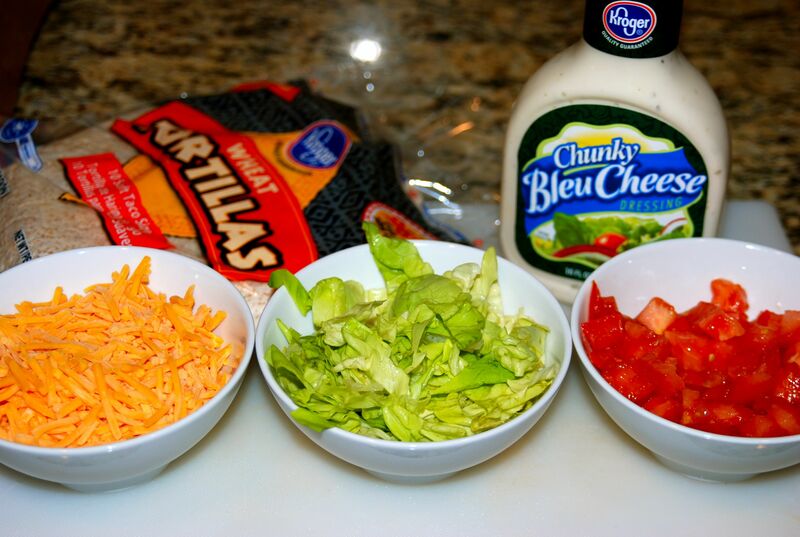 Before I start cooking the chicken, I like to get my toppings ready to go. A little shredded cheddar, some chopped tomatoes, some lettuce and yummy blue cheese dressing (or actual blue cheese would work too) is all ya need. Now move all of your toppings out of your way. 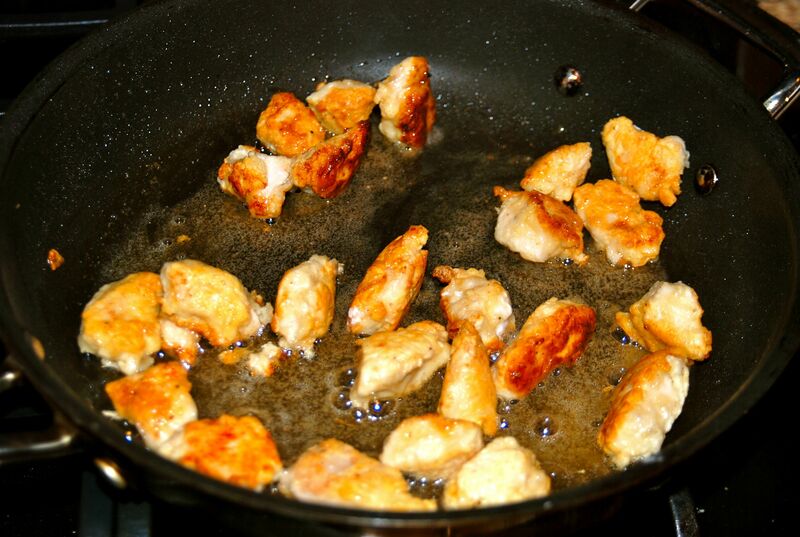 You need to set up a little assembly line to pan fry your chicken. 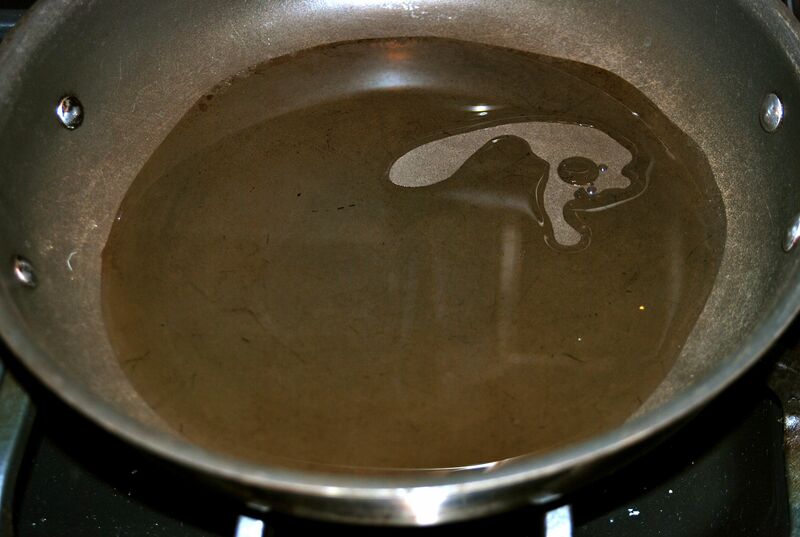 Now heat up your oil in a skillet to medium heat. 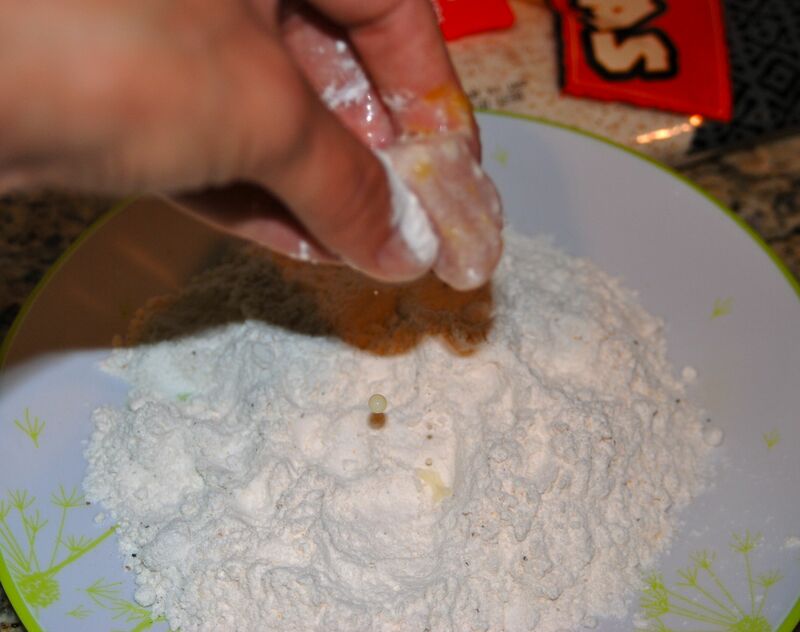 Take each chunk o’ chicken and cover it in flour. 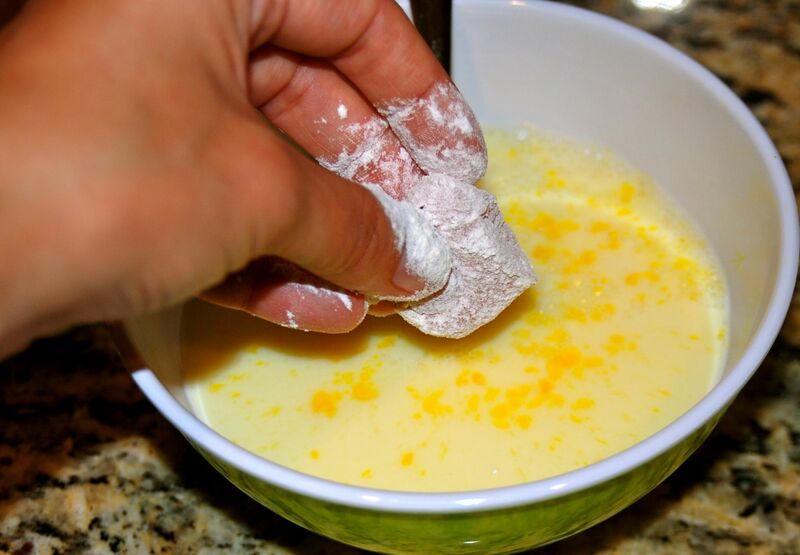 Baptize that chicken in your milk and egg mix. 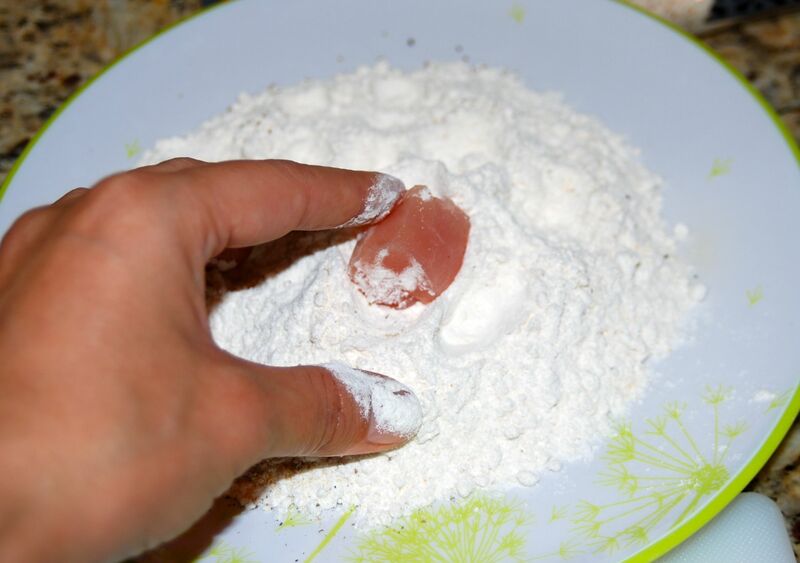 Then send it back to the flour once again. 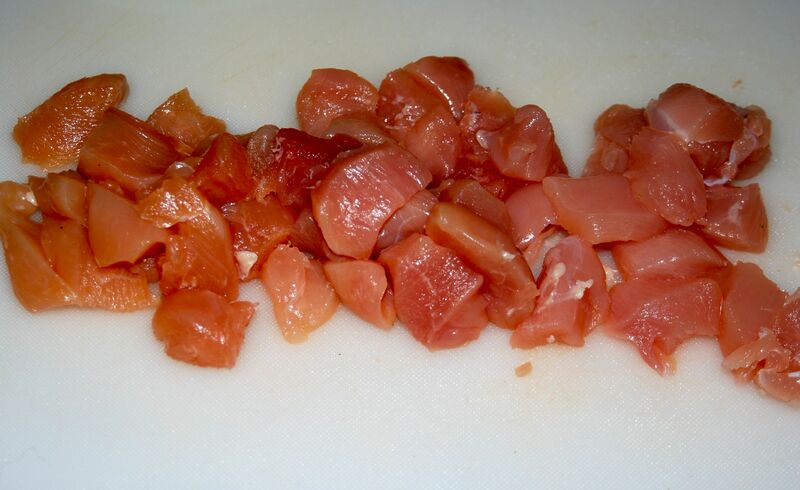 Take that perfectly coated chicken morsel- along with all of his chicken morsel friends- and drop them oh-so-carefully into the pan. Brown them on all sides. 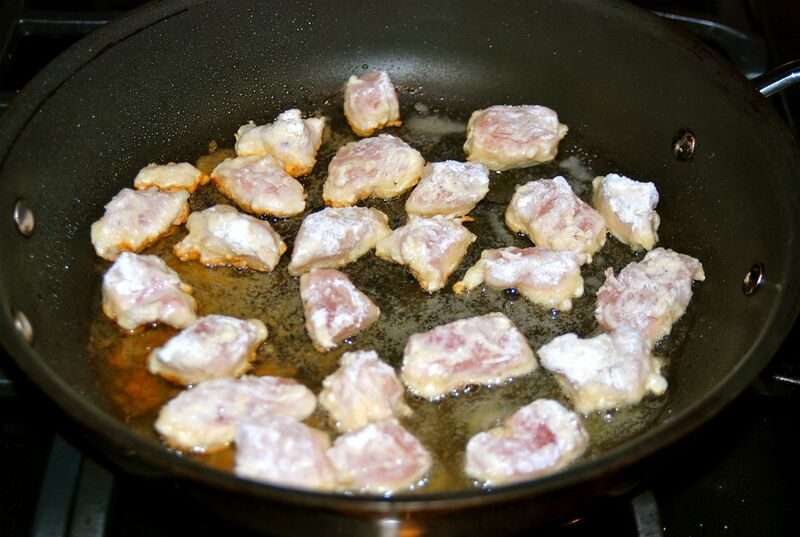 Then remove those chicken buddies from the pan onto a paper towel lined paper to drain some of the oil. 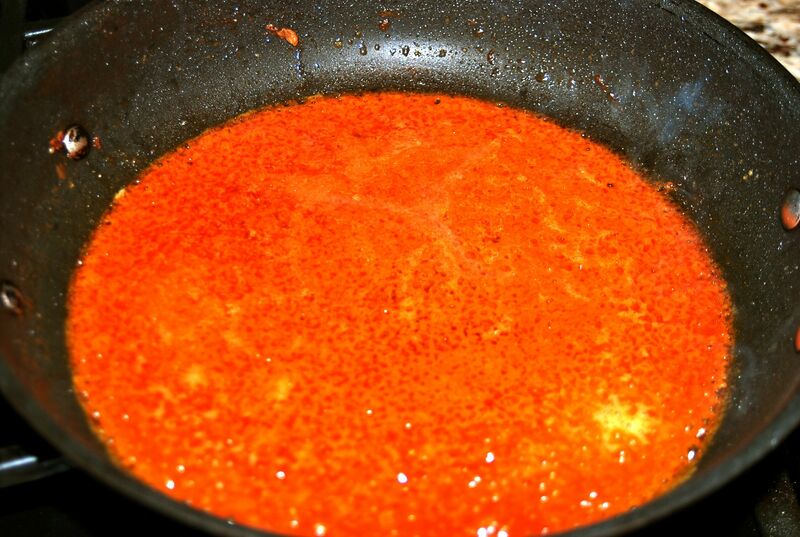 Then place your pan back on the burner (over low heat) and pour in 1/2 c. of Franks red hot. Mix in 3 T. of butter. And it magically turns into a radioactive looking buffalo sauce. Seriously, someone tell me how to take pictures of orange and red at night? 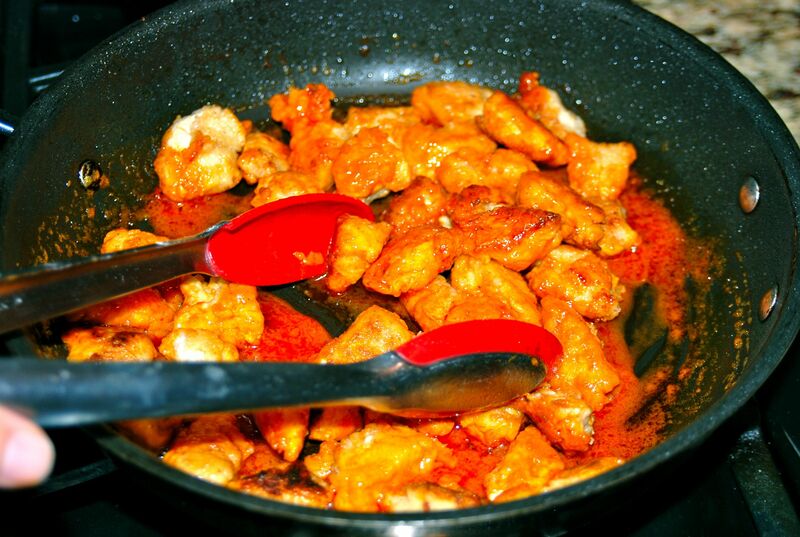 Once that sauce is heated through, give your chicken a quick toss in the heated spicy buttery good stuff. All that is left to do is build your taco. It only feels right to eat these in a soft taco shell- not a crisp one. But I suppose you can do whatever you want. But just know that if you eat it in a crispy shell, you are making the wrong decision. 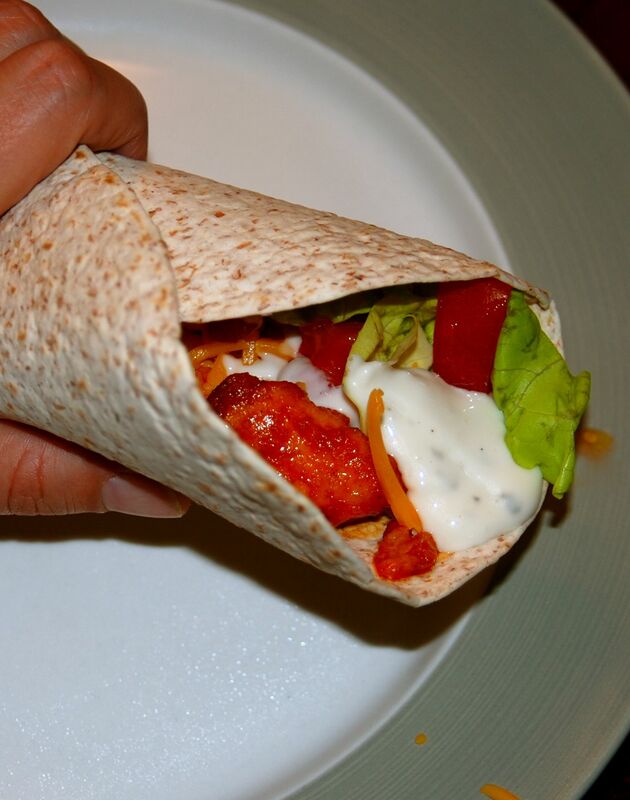 Enjoy those Buff Buff Chicky Tacs my friends!! Have a good one, will ya? And watch Parks and Rec tonight. I have a feeling you will love it! P.S If you are interested, all episodes of Parks and Rec are available for free on Hulu. So you can get caught up from the first 3 seasons if you haven’t been watching. Seriously, do it. I love that you titled this chicken dish in Tom Haveford style. I love that show and he cracks me up…obviously. I know. You crack me up too Leah. It’s one of the top three reason I come here. #1 You are obviously a cool chick and make great food (I slipped in two reasons…I know). #2 Henry, obviously. #3 You make me laugh constantly. If there were a #4 It would be for the dogs…but WHERE HAVE THE DOGS BEEN?! How did they adjust to Henry? When I had babies, my dogs did GREAT! I was amazed since I had Huskies at the time. BTW…these tacos would rock my world. I am now on to Goodle the hot sauce. Haven’t heard of it. Goodle is way better than Google…just for record. Along the same lines,, Do you undoubtedly will need title insurance plan? Is it a requirement or an added to price when investing in or offering a place? You possibly will not assume much about it, but carrying title insurance has its advantages, not just to the homeowner, but to anyone concerned in the sale and decide to buy of a place. Sounds like Seriously Fun Food!